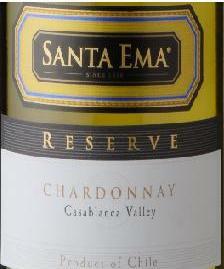 Santa Ema Reserve Chardonnay 2008 ($7). With a $7 price tag, the expectations for this week’s wine are not particularly high. On the other hand, this Chardonnay comes from Santa Ema which is a reliable Chilean producer of some very nice reds including well-regarded reserve Merlot and reserve Cabernet Sauvignon. I have had both of these reds and am a fan so naturally, I had to try the Chard. When it comes to Chardonnay, I am not partial to the fat, buttery style of many a New World Chardonnay. Rather, I prefer a leaner style that isn’t too acidic. But I do want a little roundness on the palate. So how does this chardonnay stack up? I love the fattiness of salmon. This one was wrapped in foil and roasted/steamed in a hot oven. It’s a technique that we used recently with sole (see the May 20, 2011 post). But let’s up the ante by adding two other of my favorite ingredients– turkey bacon and asparagus. Turkey bacon may not be considered to be a gourmet ingredient. However, I often find it preferable to regular bacon because of its crunchier texture when properly cooked. The key to making it is to add a little canola oil to the pan which gives the turkey bacon, a very lean ingredient, a needed boost of fat and helps to prevent it from scorching. The salmon can be plated on a bed of rice, bulgur wheat or simply over greens dressed with a light citrus dressing– it all depends on how heavy a meal you would like. The dish is a study in contrasts and balance: I love maple syrup with bacon. Voila– Sweet Salmon vs. Salty Turkey. I am enamored by texture in my food: Soft Rice vs. Crispy Bacon. Then there is the savory nuttiness of the asparagus as counterpoint to the Blank Slate of Simple White rice. Happy does not begin to describe how this makes me feel. Pierce the foil making sure not to burn yourself with the escaping steam and plate the salmon over a bed of your favorite grains or greens (such as a red leaf lettuce). You talk about the salmon, asparagus, and turkey bacon in the photo … but what about the buns? You see buns, I see breaded chicken. Some ingredients should be kept as secrets! Best just to focus the discussion to items on the plate and in our glasses– the rest will take care of itself.